Now that picnic season is right around the corner, it is time to think about easy-to-prepare picnic foods. And you can bet that at every picnic or family get together there will always be a tray (or two) of deviled eggs. 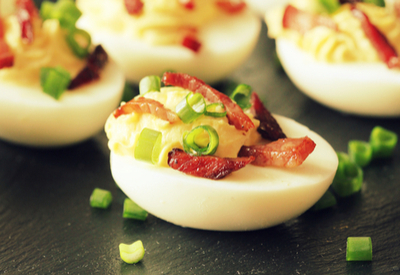 Bacon cheddar deviled eggs – a winning combinations! You might even sneak a taste of one before the meal is actually served. There is just something comforting and refreshing about eating a sliced egg topped with creamy yolk filling. I love to taste all the different versions of deviled eggs throughout the summer. There is the classic deviled eggs recipe that is a blended mixture of mayonnaise, mustard and relish. Throw a little smoked paprika on top and it reminds me of my mother’s recipe. Then there is the no-relish version. The filling is much flatter and is much smoother in texture. And have you ever had the guacamole version? Deviled eggs filled with egg yolks mixed with avocados, small, diced red onions and lemon juice. This one is absolutely delicious, but you have to be careful, as the avocado can brown quickly in the air. This weathered look can turn even the biggest fan of deviled eggs astray! 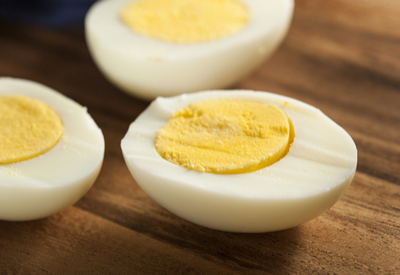 We love to make our hard boiled eggs in the Instant Pot. However, I accidentally created the best and most delicious deviled eggs recipe, purely by accident. As I was preparing my deviled eggs, I decided to use leftover cooked bacon and cheddar cheese that we used the night before to make bacon cheddar burgers. I crumbled some bacon into the filling, added the shredded cheddar cheese and the masterpiece was born! Everyone was blown away by the flavor that it added to the eggs. The tray was gone in minutes! Ever since then I get requests to bring bacon cheddar deviled eggs to every work and family gathering that we have! And if I am feeling adventurous, I will add a little barbecue sauce or diced jalapenos to the mixture. The combinatin of flavors is outstanding! 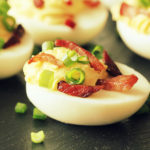 Delicious deviled eggs recipe filled with bacon and cheddar. Peel the eggs and cut the eggs in half lengthwise. Transfer the yolks to a small bowl and mash with a fork. Stir in the remaining ingredients. Spoon the mixture evenly among the egg whites. Top with garnish of choice. ← Instant Pot Potato Salad – Amish Potato Salad Made In Minutes! You mentioned, “The secret to perfectly cooked hard boiled eggs is in the recipe – even for Farm Fresh eggs” in the article but I couldn’t find it. Also, the recipe shows only ingredients and no instructions. Thank you Kari for bringing that to our attention. The instructions and link to boil farm fresh eggs is now in the article!